Shazam 2 is already in the works as Warner Bros. has tapped Henry Gayden, who penned the first movie, to write the screenplay for the follow-up. Shazam hit theaters over the weekend and continued the recent hot streak for DC at the box office. During the Zack Snyder era, which kicked off with Man of Steel and ended unceremoniously with his departure from Justice League, things were looking dark, in more ways than one, for the DC universe. But now, things are looking up and the studio isn't wasting any time in going with the hot hand on this one. According to a new report, Henry Gayden will return to write Shazam 2. There are no story details available at this time, nor is it clear when he will begin working on the script, if he hasn't already. This does signify the studio's confidence in the franchise though. Previously, Warner Bros. had announced many projects that never got going and will probably never see the light of day in attempting to play catch up to Marvel. Now they're taking it one step at a time and focusing much more on individual stories. For his part, Gayden also wrote Earth to Echo and has Last Human with Phil Lord and Chris Miller in the works. While it hasn't been confirmed by the studio yet, this report also notes that it's expected David F. Sandberg will return to the director's chair. Sandberg had previously been known for his exploits in the horror genre, with movies like Lights Out and Annabelle: Creation. But the success those movies enjoyed, both critically and commercially, helped land him the gig directing Shazam. It's also expected that the entire core cast will return, including Zachary Levi, who plays the titular hero, and Asher Angel, who plays the young Billy Batson that transforms into said hero. Shazam launched with a $159 million global debut at the box office, including $53 million domestically, which was easily good enough for the top spot. It's also very important to note that the response from critics and moviegoers alike has been exceptional, as the movie boasts a 91 percent critical approval rating on Rotten Tomatoes, to go along with a 90 percent audience score. This follows in the footsteps of Aquaman, which grossed more than $1.1 billion at the box office. Though, that movie didn't fare quite as well critically speaking. We recently heard that Dwayne Johnson may begin filming his Black Adam movie next year. 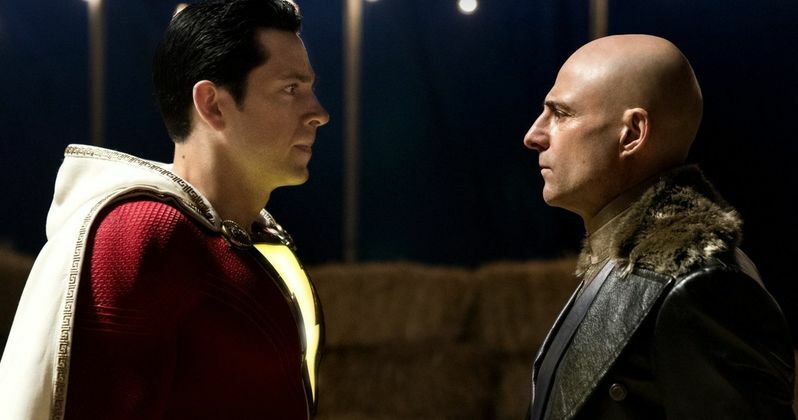 Depending on whether or not that actually happens, and depending on how soon the studio gets this sequel up and running, we could see Shazam square off against his arch-nemesis in Shazam 2, if we're lucky. In any event, it looks like DC Films has really turned things around following Justice League. Next up for them is the standalone Joker movie with Joaquin Phoenix, which arrives in October, with Birds of Prey and Wonder Woman 1984 both set to arrive in 2020. This news was first reported by The Wrap.